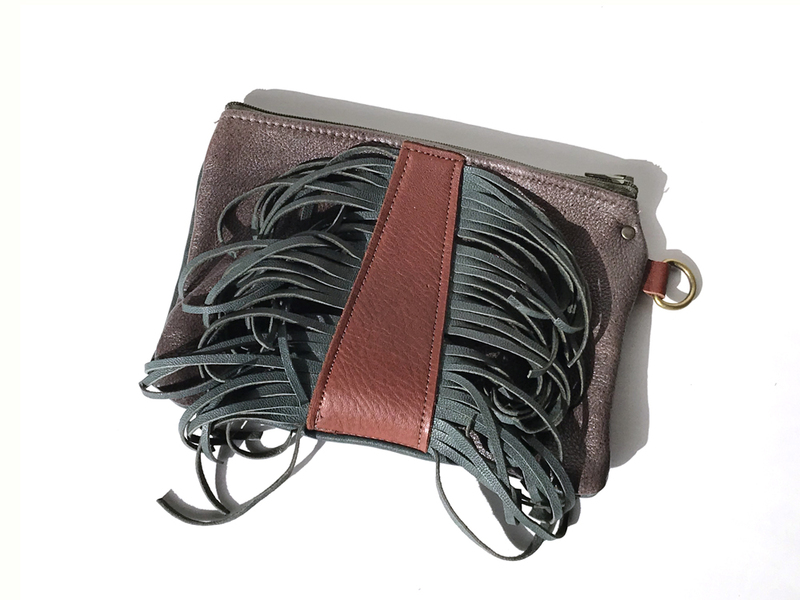 A solid reddish brown central piece of leather is surrounded by a dark forest green leather fringe, matching the green leather back of this pouch, and sits on a steel grey leather creating a lovely, rich, combination of colors. This one-of-a-kind zipper pouch is 5″x7″ – the perfect size for the essentials. It could also be used as a makeup bag. Hand-picked genuine leather selected and paired for a truly unique and one-of-a-kind piece, sewn on a vintage heavy-duty sewing machine, and finished with hand-cut leather fringe and a hand-stamped plaque.